The diagram above is my attempt to make an illustration of key concepts in the evolution of New Testament translations. My post “Translation Pathways” was a similar attempt but from different angles. I love wrestling with images — they help me learn. When reading Hector Avalos’ book “The End of Biblical Studies” and Bart Ehrman’s book “Misquoting Jesus” I kept getting lost in the discussions of translations. So I offer you the picture I have formed to help my future readings about translations. Click “more” to see the key, a brief caveats concerning the chart and links to related articles. I am deeply in debt to Ian’s writings over at Irreducible Complexity and for personal communications with Ian who has helped clarify much of this for me. 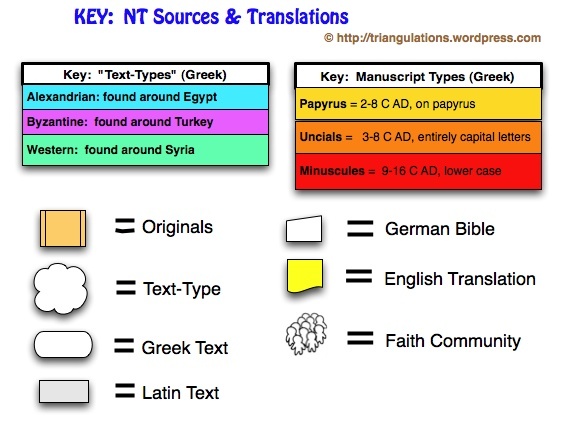 My next hoped project is a chart on Jewish Bible Translations. If I have left out your favorite translation or theological/philosophical theme in this diagram, please let us know in the comments. For suggestions from readers for improvement, corrections or new charts are always coveted! “Originals” (autographs): Of course these don’t exist (or we haven’t found them) and the dates I list are approximate and controversial. Dates: The diagram is not set to express dates very accurately by position — but it does give you some notion of time. Faith Communities: Of course the various translations are used by many different believer types. I just listed those who are preferentially drawn to this sort of text. Greek Critical Editions: These are an important part of the story in the development of the translations but unfortunately I did not see how to comfortably squeeze them in this diagram. Please read Ian’s excellent post on Critical Editions. Perhaps I can make a diagram later showing these players. Yay, well done. That was an epic effort! If you want a more systematic introduction to the texts and types definitely read Bruce Metzger and Bart Erhman’s “The Text of the New Testament.” I think it’s in it’s fourth edition. I was lucky enough to take a class dedicated to New Testament textual criticism and paleography with a skilled expert in the field so talking about the texts is a favorite past-time of mine. Good job! I could have used that figure for a short class I taught on the subject a few months back. I really think those late 80 dates for the gospels and Acts are too early. I’m thinking more like 150. Interesting stuff. I might use this for a power point presentation sometime… if that’s alright with you? (a) lots of people did when it was the “authorized” version. (b) in spite of being based on “poor [Greek] text [sources]” it is still “generous and liberal” and so it is useful. That implies we should sacrifice accuracy if something says what we want it to say. But I am sure you did not mean that. But I agree that it may be of value to study something faulty so as to see what others value in it and how they did not see through the mistakes and how they used it to create their histories. Especially if it has been valued by a large number of people. You didn’t mention if you found the chart useful or accurate. Does it roughly match your understandings? @sabio, adhunt, I’m not sure I’d be happy with a stark contrast between the flawed KJV and not flawed other translations. The traditional translation of the KJV casts a *long* shadow over modern translations. And one has to say, for the time, the KJV was a masterwork. For example: the whole point of creating the NIV was because the RSV translated certain passages that Christians took to be about Jesus in ways that were more accurate to their original text. So RSV has Isaiah say “a young woman has conceived and will give birth” which would mismatch the quote of that passage in the NT. One of the explicit goals of the NIV was to do the translation from an evangelical point of view so that those passages could be harmonized. Hence NIV has “a virgin has conceived”, with the KJV, and against the original text. In my opinion of course, its not my blog! Ian… my blog is aimed at educating the lay person. As it turns out, many people just don’t know anything about religious history. Nadda! Zilch! A big fat zero. If they knew, for example, that almah’ actually means ‘young virile woman’ and not virgin… then they too would be more skeptical of the Evangelical translations and paraphrases of the NT and Bible. So it’s important to bring these points of discussion up and state precisely, and clearly, the information along with scholarly support to show that it’s not just a bunch of Satan worshiping atheist cannibal nudist child molesting goat rapers trying to unsave souls for the Anti-Christ–or what have you. Tristan (and anyone else, including rey), Sorry, my response was a bit snarky. I was responding to rey’s comment that the dating of the bulk of the NT should be in the second century. This is an argument which almost always is based on some poor scholarship and a deliberate unwillingness to deal with the consensus among biblical scholars. There are literally two or three scholars with this opinion, but the vast majority of people expounding this view are folks with an axe to grind. I perceived in rey’s comment a desire to take Sabio’s herculean effort to sum up consensus scholarship and ask for it to be tweaked into a something that perpetuates his/her personal propaganda. Maybe I have a hair-trigger on these issues. Maybe I just know how much effort Sabio put into this. Anyway, clearly I had a proportionality lobotomy. As for your other comments. Abso-flippin-lutely! I couldn’t agree more. My blog is also aimed at explaining consensus scholarship on the bible. Hence my comment about the KJV/NIV/RSV. And I would agree with your comment and go further. I am of the opinion that critical study of the bible is one of the most powerful tools that we have against bibliolatrous fundamentalism. I know but I can still say it. Indeed: Biblical ignorance among those who feel the Bible is “God’s Word” is rampant. So sometimes showing these believers the nature of their own scripture can be eye-opening. It was for Ehrman. You have the 90ad autographs of Revelation practically kissing the earliest cloud of the Alexandrian (African!) and Byzantine texts of 200ad. Um, isn’t that a tad misleading? How much first hand info do you know about the Civil War? Answer: NONE. Second hand? Um, probably none. But the Vulgate (the first canon) was generated in the 4th century because “there were too many frickin’ manuscripts floatin’ aroun'”)! I’d love some concrete positive suggestions. See the “Date” caveats in the post. I tried align the middle of those autograph boxes in line with their date. It is a box, after all. As for the rest of your rant, I am not sure who it is directed at. It does not appear that you have taken time to look at my blog. After feedback on another site, I went and aligned dates a bit more carefully. Hope folks find it useful. Any further suggestions are welcome. this is a fantastic chart. i have emailed it to my Biblical Interpretations profs (also OT and NT profs as well) and they were vastly impressed. excellent visual for source, form, and translational skill sets. can i have permission to use this in future bible studies? Sure, please feel free to use, but please quote your source. Glad you liked it. Just came across this post. Great graphic! But you might want to extend the Catholic bibles a bit further into the future. The New Jerusalem Bible (NJB) was first published in 1985 and the New American Bible (NAB) in 1990. Both involved both Protestant and Catholic scholars translating from the original language texts, practices encouraged by the Vatican II document on scripture. And the NAB is used in the lectionary (readings at Mass) in the US (and I believe other English-speaking countries as well), so it strongly shapes Catholic thought today. I’ve never even seen a Jerusalem Bible except in the library, though my mother had a dusty Douay-Rheims on the top shelf of her bookcase. Thanx, Gaudete. I will consider the addition.